Liz Did It: I Made My Bed, And I Will Lie In It! I Made My Bed, And I Will Lie In It! I developed an obsession with the Stratton Bed from Pottery Barn. My dad took half a look at it and declared that $1,300 was ridiculous, and he could make it for a fraction of the cost. Welp… works for me! Full disclosure, my original intention was to help build this thing. I wanted to use drills, and saws and hammers. Inhale saw dust. The whole nine. However, my dad beat me to the punch and had it 99% done before I even knew he started it. Thank God for early retirement. I did a little research and found great plans from Knock Off Wood. The only catch (and there’s always a catch) I wanted the design of the twin bed, but in full size. The Queen version at PB has two openings on the side and one at the head of the bed. I wanted three down the side. Like the twin, but wider to fit a full mattress. Dad to the rescue. Now, I’m not really a basket person so I struggled with what to use underneath. After much searching and many many country barfy baskets, I found some online at World Market that fit exactly. And at $15 a pop I might add. It’s like they were made for this. I would have broken down and bought the PB version if they sold them solo. The problem is you have to get the $1300 bed to get the dang baskets. These are actually pretty shallow but it’s fine. It’s enough to hide what’s behind, and leaves tons of storage space. It all just fell into place. Also amazing is that the bed breaks down into pieces, which makes it easy to move. Not that I’ll be doing that anytime soon. And remember my Brimfield find turned pillow? I lurrrrve it on here. I am so incredibly happy with it, I only wonder why I didn’t do it sooner. Talk about storage, I can fit an insane amount under there. I have luggage, extra linens, off season clothes and the list goes on. 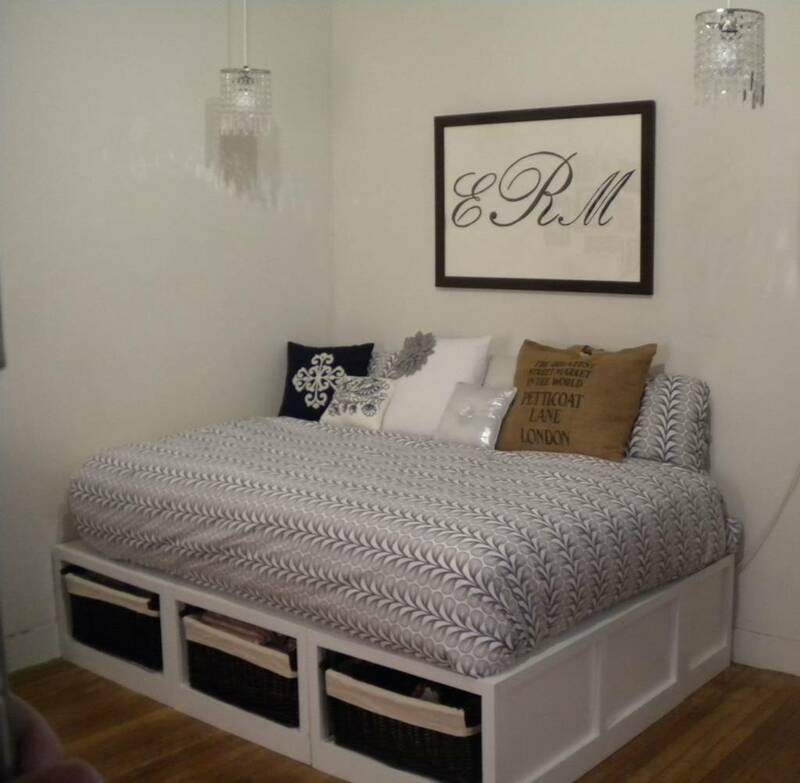 The Pottery Barn version is amazing, and I wish I had that much money to drop on it. But it’s pretty great to have one that was made for me, the way I wanted it. Nighty night my little bed bugs!